So Long, Edinburgh Yarn Festival! I can barely believe that it's over. We had been thinking about EYF, and planning for it for not far off a year, so it feels mighty strange that it is now in our rear view mirror. But what a wonderful time we had! Having arrived safely on Tuesday evening, we had a great dinner at Akva and caught up with comrade Felix. It was ace to hear all about her upcoming books, the Knitsonik Stranded Colourwork Playbook and Colouring Companion. I was rather over excited about her first book, the Knitsonik Stranded Colourwork Sourcebook (we are currently out of stock as the first batch flew off the shelves, but more will be coming) and this sequel has had a similar effect on me! Ready to teach! Thanks to Renee Callahan (EastLondonKnit) for taking my photo! Wednesday was my first class, teaching Clever Cast Ons to an intrepid group of international knitters. We worked our way through the pinhole cast on, which was fiddly but I think everyone got there in the end, then on to Judy's Magic Cast On (three ways - it's not just for sock toes!) and ending up with my favourite, the tubular cast on, which caused shrieks of delight. No really, it did! I felt happy that I wasn't the only one to be over-excited by a knitting technique. Alix is tidying up the last bits on the tables of our stand. I headed straight from the Risk Factory where my class had been, over to the Corn Exchange to help Jim set up our stand. Alix arrived shortly after me, and we made a crack team putting the gridwall together and hanging up all the pretty yarns. The afternoon passed incredibly quickly as we built the stand, and before we knew it Ann (of MDK fame) had arrived to meet us for dinner. Despite years of working together on one project or another, we had never actually met in person. This was a theme that repeated throughout the show – meeting people in person, I'd only previously spoken to by email or online. It always amazes me how natural it feels! Ann and Alix put the finishing touches to our stand and then we wolfed down some much-needed Chinese food from the buffet next to the Corn Exchange. And before we knew it, it was time for the marketplace to open on Thursday morning! The marketplace at EYF was even more packed with knitterly treats than ever! It's hard to describe just how much knitting there was packed into the marketplace! Not just on display in all the vendor's booths, but even more so, being worn by the visitors. There was a constant parade of exquisite knitwear, sweaters, shawls, socks and more. You can just about see our booth at the far left of the photo (Jim has his back to the camera!). It was quite a different experience to be working on our own stand. I've previously done a number of shows for Jeni at Fyberspates and for the last 2 years I've worked on Kate Davies' stand at EYF, so I'm quite show experienced, but selling your own products is a bit different! We didn't get a great deal of sleep going in to Thursday as there were just so many things to try to keep track of, but in the end everything worked smoothly. We had plenty of signal for our online shop software to work correctly and the card reader behaved really well! It was absolutely brilliant to see so many people wearing beautiful finished items from A Year of Techniques. I just wish I had had more time to stop and take photos of people in their projects. We gave out lots of our AYOT needle gauges, but there are still a good few left, which I will add to the online shop shortly. 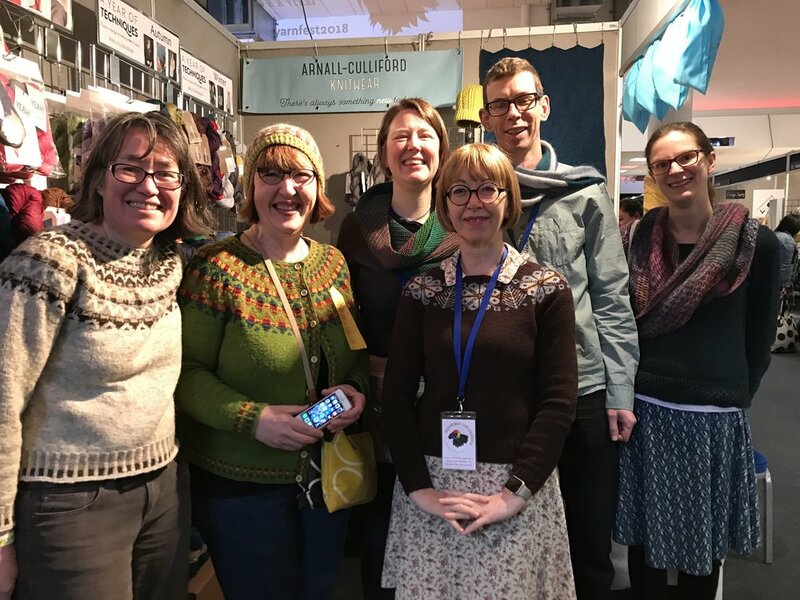 Left to right: Maylin (blithespirit), Julie (crochet-julie), me (JenACKnitwear), Alix (AlixPearson), Jim (VeufTricot) and Anna (annaksimpson). On Thursday evening we had an A-C Knitwear meet up at Akva, which was awesome. It was lovely to sit and chat with friends from our Ravelry group, but the lighting was terrible, so I'll spare you all the grainy photos, and instead I'll share this one of a few of us on the stand on Friday morning. Friday was much busier in the marketplace as there were walk-in visitors as well as advanced ticket holders, and the morning was gone before I even knew it. I had lunch with some of the other teachers, and then I walked over to the Water of Leith Centre with Nancy Marchant for my second class, this time on Helical Knitting. Many thanks to Janet for catching a photo of me mid-flow in my Helical Knitting class! (If you are reading this on the email update, you'll need to click through the link above to see Janet's photo from Instagram.) The class were really enthusiastic and worked hard to get their heads around all the different ways of knitting helically. I look forward to seeing helical projects appearing across the internet in the coming weeks! And then, like Janet, we then headed to the Ceilidh for our evening entertainment. I don't know how Jo and Mica have packed so much in to this year's EYF. 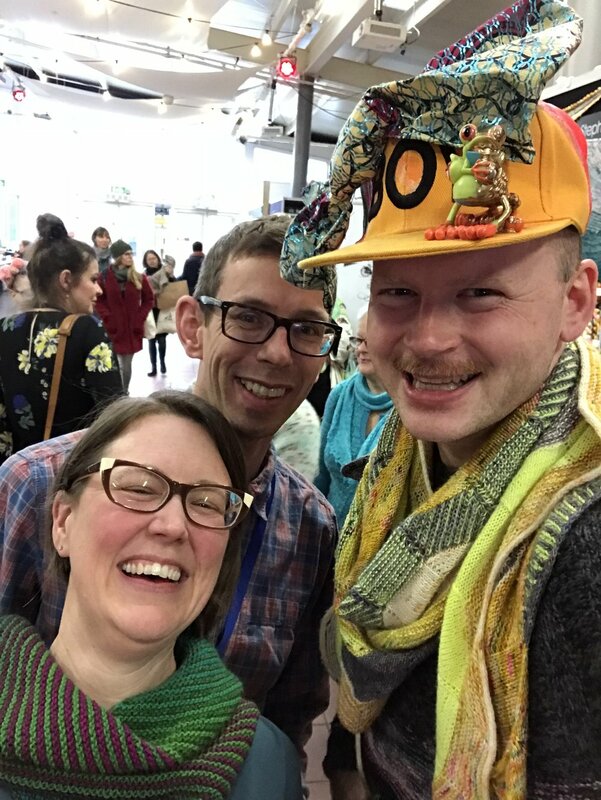 It really was wall to wall opportunities to hang out with knitters and experience the delights of the yarn world. Team Cables were all at EYF! We had a little Something New to Learn About Cables reunion on Saturday, as Rachel Coopey was on the stand opposite us and Lucy Hague had a booth just round the corner. Rachel launched her incredible new neon shades of Socks Yeah! 4ply at the show (they will appear in the online shop when we return from our hols), and Lucy launched a stunning new design, Bain, which features a totally reversible cable pattern. I bow in the general direction of Lucy's cable genius! Jim and Andrew caught up in person. 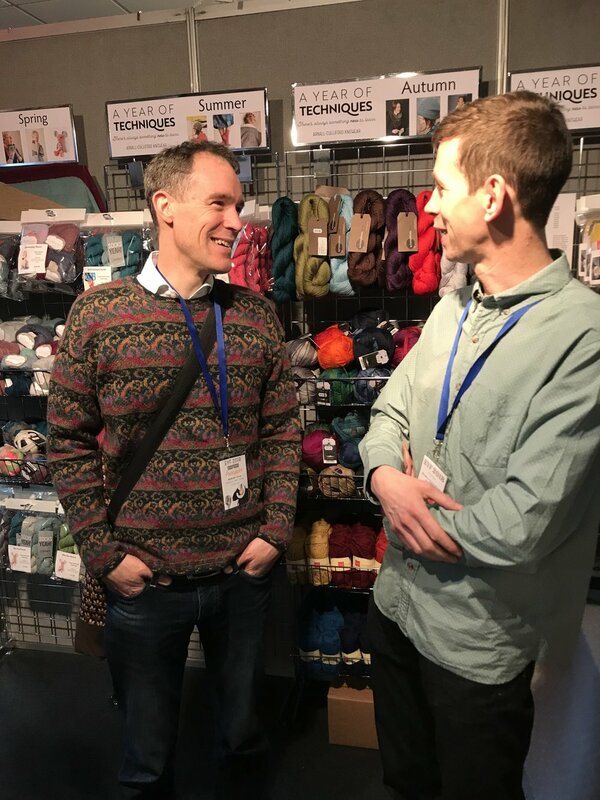 It wasn't just me catching up with old and new friends, Jim managed a chat with Andrew from Fruity Knitting, as well as finally putting real life faces to a number of people he has worked for, including Carol Feller and Woolly Wormhead. The A-Cs meet Stephen West. We would not have been allowed back into the house if we hadn't got a photo of ourselves with the inimitable Stephen West. The kids are HUMUNGOUS fans of his videos and Instagram posts. They were pretty unimpressed that we didn't just bring him home with us, but getting a photo took the edge off their disappointment a bit! And I do feel like I should apologise to Stephen (who had clearly worked incredibly hard throughout the show) for inadvertently making him think we wanted him to sing... That would have been a crazy request at the end of the day on Saturday! All that remained was to break down the stand and pack it all into the van. By this point I was absolutely beyond tired. It took a lot of help from Jim to get me back to our hotel and into bed that evening – I don't think I've ever been so tired in all my life. I slept well though, which was a good thing as we woke up on Sunday morning to quite a bit of snow. Not what you need when you have to drive from Edinburgh to Somerset! Jim did a sterling job and drove all the way back down south. We stopped in with some friends in Chester on the way back down, which provided a very welcome injection of energy and support! And eventually we made it back to Frome in one piece, despite the best efforts of the weather. What an incredible week it was! I bought absolutely nothing, and barely made it off our stand for the whole show. There are loads of friends who I know were also at EYF who I didn't see or manage to talk to, but I guess that just means we will have to try to return again soon! Massive thanks to Jo and Mica for all their hard work, and to everyone who came and chatted and shopped with us.